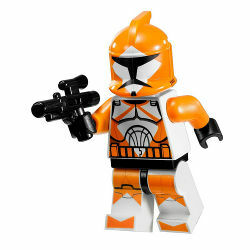 The Bomb Squad Trooper is a specialized clone trooper minifigure from the Star Wars: The Clone Wars theme. The Bomb Squad Trooper has distinctive orange markings on all of its pieces depicting armour. The legs are white with a black hip piece, and on the front of the legs is orange printing for the primary colour of the armour, with an area of the leg leaving white exposed to represent shin plates. Black printing is also used on the piece for adding extra detail. The torso piece features the standard printing design of a normal The Clone Wars Clone Trooper, but has additional orange printing on it. On the front, triangles beginning approximately half-way down the piece and meeting in the centre at the bottom are present, along with outlining around the top of the body armour and lines running from the top of the triangles in to the centre at the top of the piece. The back printing also features a similar pair of triangles and line around the top of the armour, as well as the backplate being coloured in orange. The arms on the torso piece are the same orange, and the hands are black. The head piece is flesh coloured, and features the standard The Clone Wars clone trooper design- white, brown and black printing for the eyes, black printing for mouth and eyebrows, and a darker flesh colour for face detailing at the sides and the top. The helmet piece is orange, and features the standard black visor pattern, but also has a white diamond, which is centred around the visor. Two of these troopers come in and are exclusive to the 7913 Clone Trooper Battle Pack, where one is armed with a blaster and the other with a blaster rifle. Bomb Squad Troopers, also known as clone ordnance specialists, were trained in the disarmament and disposal of bombs and other explosives. Four of these troopers were deployed on Naboo to race to dismantle virus bombs, containing the deadly Blue Shadow Virus. This trooper is the only The Clone Wars trooper to have a helmet that doesn't have a base colour of white. LEGO Club Magazine Issue 1 2011 - Watch out for the Death Watch! Facts about "Bomb Squad Trooper"
This page was last edited on 9 January 2016, at 23:23.